We departed Helmond at about 8am with a cool start to the day after the rain… but it didn’t last long. We skirted Eindhoven and stopped for breakfast in Valkenswaard. First international frontier came soon afterwards: Belgium! In Achel vvv we found a nice map of the Limburg bike ways and followed a rail trail most of the way to Hasselt. It was hot riding but lots of forest and shady stretches along the way. In Hasselt we phoned a WarmShowers contact and asked if we could have a bed for the night and received a ‘yes’! That was great. So we met Sara and her partner Joris, their enormous dog Babar and their friends Geert and Heidi. First activity was a drive to a disused gravel quarry that’s a little known swimming spot – a perfect cool down. Then a nice dinner with Belgian beer and special dishes (I’ll put the names in later!). None of our companions were interested inn the World Cup, despite that fact that the final was on, so we went to bed without knowing the result. A disappointment to check BBC news in the morning to find that Holland had lost. Sara is a beekeeper in her spare time and she works for an NGO teaching sustainability principles to primary school children. And she’s having a baby in December. 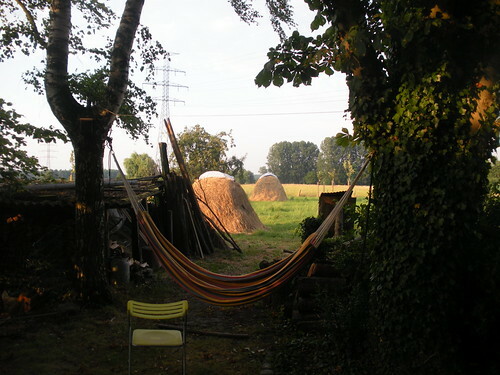 She provided a tent at the back of the house – very comfortable! And a lovely experience to meet new people, much younger than us, and to feel that we had much in common and enjoyed each other’s company. This entry was posted on 12 July 2010 at 9:10 pm and is filed under Belgium, Netherlands. You can follow any responses to this entry through the RSS 2.0 feed. You can leave a response, or trackback from your own site.